John Heartfield, who was a peer and a sincere friend of the well-known theatre director and playwright Bertolt Brecht (1898-1956) impressed the art of photomontage radically at that period. 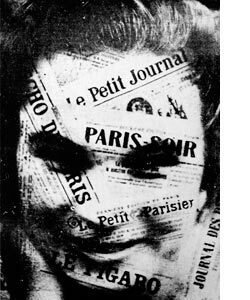 In terms of the formal structure, the technique and the negations as well as the fighting spirit and the artistic attitude, the photomontage also held an equivalent position among the other pioneer authentic movements of art such as cubism and expressionism to arouse the world against the rise of Hitler and the Nazism. Struggled against the multidirectional propaganda of the Nazis, John Heartfield especially made visible the facade of the Nazi regime via a wide variety of arts. I am a cabbagehead, recognize my leaves? 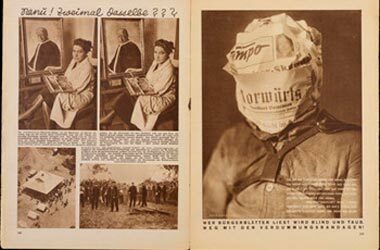 Sabine Kriebel explains that John Heartfield’s photomontage “Whoever Reads Bourgeois Newspapers Becomes Blind and Deaf: Away with These Stultifying Bandages!” presents how the political aesthetics of the image should be interpreted. 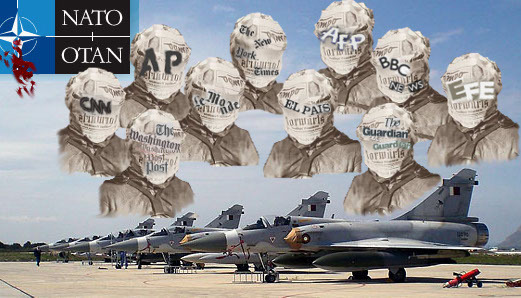 “The discourse of Whoever Reads Bourgeois Newspapers Becomes Blind and Deaf! investigates all sorts of concealment of production. In this photograph, a Cabbagehead mummified with the scraps of newspapers, directs the viewers the question of “I am a Cabbagehead, recognize my leaves?” by the help of a footnote at the right corner of it. Due to the newspapers covering the eyes, the mouth and the head, the man is deafened and silenced. He can see or speak no longer. Even, according to the caption printed in black and thick letters, “Whoever Reads Bourgeois Newspapers Becomes Blind and Deaf”, he can’t hear. 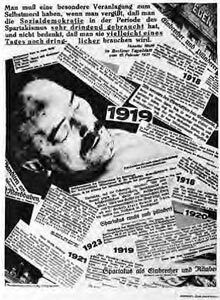 The mainstream newspaper of Social Democratic Party, Vorwaerts and a popular socialist newspaper Tempo, thus addresses to the press of the bourgeoisie. The image not only arouses a feeling of violence achieved by the cut-and-paste technique, but also it represents a psychological disturbance created by a realistic presentation. 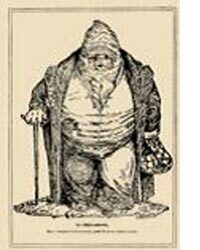 Honoré Daumier, M. Chevassut. “Last Shareholder of the Constitution” (Dernier actionnaire du Constitutionnel), 1st Febryary, 1834, Le Charivari. 26,7 x 18,2 cm gravur. According to Franck Knoery, most of the photomontages of John Heartfield have been directly inspired of the caricatures of Honoré Daumier (1808-1879) drawn for the newspapers Le Charivari and La Caricature. The bourgeoisie whose head is sandwiched between the reactionist press is deafened and made blind may be an excerpt of gravure representing “Last Shareholder of the Constitution” (Dernier actionnaire du Constitutionnel) which was printed in Le Charivari on the 1st of February, 1834. Similarly, the montage he arranged in concern with the untimely recession of the allies and a Prussian casque which overshadows the sun in the Rhein Valley makes a reference to a work of lithograph composed in 1871. 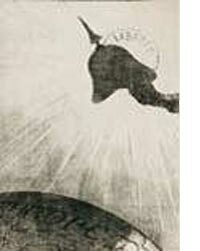 In this work, the Prussian casque leaves the whole Europe under its shadow by covering the sun of liberty. Consequently, as remarked by Franck Knoery “Different samples covering the imitation and quotations can be multiplied as well as the other works composed by various graphic methods”. 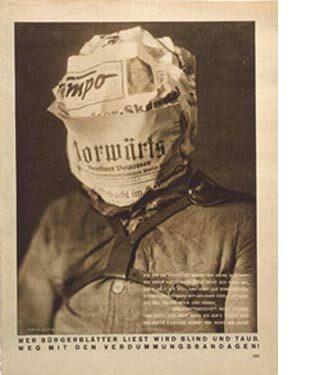 John Heartfield had never intended to win a name for himself. His real purpose was to warn the community against the Nazis who threatened social justice and human rights. Although the agents and the territory have changed, the misdeeds which were referred to by John Heartfield, the militarism, war usury, genocide, holocaust, political corruption and conspiracies, still persist today. A. C. Danto, “John Heartfield and Montage”, The Madonna of the Future, Essays In A Pluralistic Art World, p. 5, 2001, University of California Press Ltd.: London. [ 3-10] Citation: http://books.google.com.tr/books?id=VHHizA7ZW0cC&printsec=frontcover&hl=tr&source=gbs_ge_summary_r&cad=0#v=onepage&q&f=false, The date accessed: 21/03/2013. Source: http://www.getty.edu/art/exhibitions/heartfield/whoever_reads_fullpg_zm.html, The date accessed: 20/03/2012. D. Kahn, John Heartfield, Art and Mass Media, 1985, p. 73, Tanam Press: New York. With the mentioned colours here black, red and golden, he refers to the national flag of the Weimar Republic (1919-1933). C. Kay, “Art and Politics in Interwar Germany. The Photomontages of John Heartfield”, Left History. An Interdisciplinary Journal of Historical Inquiry and Debate, Vol 4, No 2, p. 32, 1996. [11-50] Citation: http://pi.library.yorku.ca/ojs/index.php/lh/article/view/6982/6166, The date accessed: 21/03/2013. See. http://www.getty.edu/art/exhibitions/heartfield/whoever_reads.html, The date accessed: 21/03/2013. M.Lavin, “Heartfield in Context”, Art in America, p. 89, 1985 [85-93] Citation: http://www.johnheartfield.com/HEARTFIELD-ART-CONTEXT/john_heartfield_ART_CONTEXT_01.html, The date accessed: 22/03/2013. S. Kriebel, “Manufacturing Discontent: John Heartfield’s Mass Medium”, New German Critique 107, Vol.36, No. 2, p. 62-65, 2009. [53-88] Citation: http://cora.ucc.ie/bitstream/10468/215/1/Kriebel_HeartieldSuture.pdf, The date accessed: 20/03/2013. Source: P. Pachnicke, K. Honnef, John Heartfield, 1992, p. 277, Harry N. Abrams Inc: New York. E. Siepmann, John Heartfield, 1978, p. 27, Foro Buonoparte: Milano. 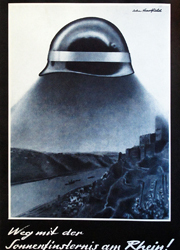 Source: W. Herzfelde, John Heartfield, Leben und Verk, 1971, p. 234, Auflage VEB Verlag Der Kunts: Dresden. M. Bostancı, John Heartfield and The Interpretation of The Object, p. 386, Unpublished Postgraduate Thesis, 2012, Işık University SBE, İstanbul. A. C. Danto, Op. cit., p. 7-8.